Recorded July 1994 at The Lefrak Hall, Colden Center for the Performing Arts, Queens College, New York (except tracks 11 & 20, Gershwin The Man I Love and O Clap yo’ Hands, recorded July 1991 at Barbirolli Hall, St. Clement Danes School, Chorleywood, from “The American Virtuoso”, Argo 436 121-2). This recital serves as a welcome companion to Feinberg’s “American” trilogy recorded for the same label, “The American Romantic” (Argo 430 330-2, 1990), The American Virtuoso (436 121-2, 1992) and The American Innovator (436 925-2, 1993) (links will open new tabs to my reviews). It should have been titled “The American Crossover”, really. In the very perceptive liner notes, Feinberg explains that, while, “ironically, as our society has grown more inclusive and accepting of different cultures, the musical arts that represent these different portions of society have grown more polarized and isolated”, in the early years of the 20th century, for all the racial and social divides that existed in America, music mixed and intermingled: “in the music world there was a warm interest and lively discourse between the different styles of musical endeavor. The juxtaposition of classical and popular musical material is more unusual now than it was earlier in the century, and performers’ interest in each other was stronger and less self-protective. James P. Johnson was friends with Gerswhin and Godowsky, Horowitz and Tatum compared their `Tea for Two’ arrangements”. So Feinberg says he tried to offer “a ‘crossover’ recording with a difference”, presenting jazz and classical “stylings” in one package. I’m not sure he entirely realizes his program, though. You’d expect to be served a salad of Jazz-influenced classical music and classical-music-influenced Jazz. But then, Feinberg and annotator Marion S. Jacobson, in their respective liner notes, refer to a host of pieces that you’d expect to be featured on the recital, but they’re not: it would have been nice to hear James P. Johnson’s “Russian Rag” based on Rachmaninov’s Prelude in C sharp minor”, Bud Powell’s “Bud on Bach”, Tatum’s “Humoreske” after Dvorak or “Massenet Elegy”, his AND Horowitz “Tea for Two” arrangements. 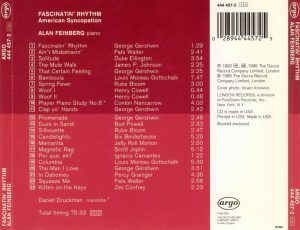 Feinberg also refers to the influence of the “American explosion” on composers like Stravinsky, Hindemith, Wolpe, Milhaud, but offers none of their pieces. Stravinsky’s Ragtime would have been an obvious candidate, or George Antheil’s Little Shimmy. So what we get is a few pieces of Gottschalk – seen as a precursor of the crossover for his cross-breeding of Chopin and the music of the slaves of New Orleans – and Gottschalk’s Cuban student Ignacio Cervantes, of Joplin (“Magnetic Rag”), of Gershwin, of Grainger, and of Cowell and Nancarrow, for the “classical side”; and compositions of Duke Ellington, Fats Waller, James P. Johnson, Rube Bloom, Bud Powell, Bix Beiderbecke, Jelly Roll Morton and Zez Confrey for the Jazz side. What’s “classical-influenced” about the latter, I don’t always hear. Sure, if I heard the first bars of Beiderbecke’s Candlelights without knowing who had composed it, I’d immediately shout “late Scriabin”! And it’s interesting to hear how Scriabin can morph into and back out of Jazz. Other than that, If you want to consider that digital virtuosity is a thing of classical music, then, sure, these compositions are “classical-inspired”: the digital virtuosity of Fats Waller’s “Ain’t misbehavin’“, James P. Johnson’s “The Mule Walk“, Rube Bloom’s “Silhouette“, Zez Confrey’s “Kitten on the Keys” (especially the way Feinberg plays it – see below) can be equal to anything written by, say, Chopin, especially the right-hand runs (the left hand is most of the times confined to the usual striding um-da um-da). But if you DON’T consider that digital virtuosity is exclusively a thing of classical music (and why should it be? ), then I don’t hear much that is reminiscent or evocative of the sound-world of classical music, neither melodically nor harmonically. These pieces are pure Jazz – I’m not saying that with a disparaging intent. I don’t hear any “crossover” in those pieces; I recognize crossover when I hear John Lewis or Jacques Loussier improvise on Bach. On the other side of the barrier, hearing Gershwin’s “That Certain Feeling” right after Johnson’s “The Mule Walk“, or “Clap Yo’ hands“… I don’t hear much difference, nor greater sophistication. Gershwin, a Jazz-inspired classical composer? On the basis of these pieces, and in this context, I’d rather call him a classical-influenced Jazzman. 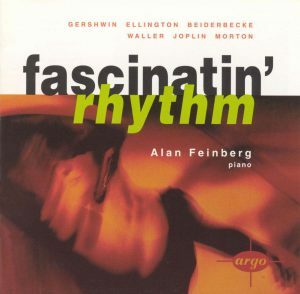 True, there is, in “Fascinatin’ Rhythm“, a digital virtuosity that’s not so far removed from Nancarrow’s – but then, that’s not significant of Gershwin, it’s significant of super-virtuoso Earl Wild, the author of that transcription. And I was about to write that there was a harmonic plenitude in “Promenade“, while announcing a kind of cool Jazz style that you’d associate with much later jazzmen than Gerwhin – when I realized that I was in fact listening to the next track, Bud Powell’s “Dusk in Sandi“. Gottschalk’s “Bamboula” starts well, with pounding basso chords that could be out of Antheil, and then it evolves into something of a Chopin Polonaise from New Orleans, which might have been more fun if Gottschalk didn’t milk out so much the wistful tune of the middle section. And is this “crossover”? If it is, than any Chopin Mazurka or Polonaise is also “crossover”. And I don’t hear much difference between “Columbia” and the piano accompaniment of a Schubert Lied from Schöne Müllerin. If “Magnetic Rag” is Joplin’s “most ambitious” ragtime, as Jacobson contends, it makes me scratch my head at what his less ambitious ones might be. Oh, yeah, sure: at mid-point he goes into minor – wow, what a compositional feat, to make Bach blench with envy. I can’t even say that this is not very sophisticated music. However entertaining it may be for the saloon, this is appalingly simplistic music, and there is more sophistication in many of the pure jazz pieces that Feinberg plays. Remains, then, Grainger’s “In Dahomey (Cakewalk Smasher)“. Yes, that’s an earlier version of Earl Wild playing with Ragtime and turning its inside out with crazy glissandi, and the coda is almost a Nancarrow Study for Player Piano. Speaking of Nancarrow! 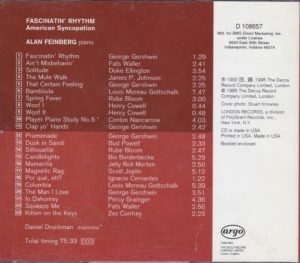 It WOULD have been intesting to play a “fast” Nancarrow Study after Confrey’s “Kitten on the Keys“: it would have made clear where Nancarrow starts: in the Boogie Woogie gone rhythmically berserk. And the Classical in Nancarrow lies precisely in the “rhythmically berserk”, pushing to their limits techniques of counterpoint that hark back to Bach and irregular meters explored by Bartok and Stravinsky. But the selected Nancarrow Study, No. 6, given here in a transcription for piano and marimba (probably to make the voicing very clear), as beautiful as it is, is a slow and evocative one. But more on Nancarrow and Cowell hereafter. As for Ignacio Cervantes’ “Porque, Eh?” – the second of his Two Cuban Dances, the score of which can be found on the International Music Score Library Project -, I guess you can call it real crossover: it sounds like a simple, dreamy ballad in the manner of Mendelssohn’s Songs without words, but with the off-beats of a mambo. All this is very entertaining then, mostly in an “easy-listening” way. But – sorry amateurs of Ragtimes and early Jazz – the pieces that immediately and without a doubt strike one as the unquestionable masterpieces are the three compositions of Nancarrow and Cowell. The rest may be lively, boisterously unleashed, virtuosic and entertaining and fun and everything you like, it is also very formulaic and repetitive, with the constant stride hum-ti-hum-ti left hand. These unfold – in 45 seconds for each of Cowell’s “Woofs” – a totally original sound world, that is uniquely their composer’s and immediately catches the ear. The transcription of Nancarrow for piano and marimba works marvelously well, making the Study sound like some nostalgic, poetic and dreamy homage to the music of West-Africa. From the few pieces I followed with score – especially the two Gottschalk pieces [addendum from September 2018: and Confrey’s “Kitten on the Keys“] – Feinberg appeared to play with snap and precision. [September 2018: In “Kitten”, he takes the same racing and dizzying approach that other classical pianists who have tackled the piece have adopted, Marc-André Hamelin in a live recital given at the Husum Castle in 1989, published on a hard-to-find Danacord CD DACOCD 349 (no barcode, link will open new tab to CD’s entry on Discogs.com) but uploaded on YouTube, and Eteri Andjaparidze in 1995 on Naxos 8.223826 barcode 730099382625 (you can also hear it on YouTube). It is certainly NOT true to tradition – as established by Confrey himself in his 1921 recording – nor to the “Allegro moderato” tempo indication of the score (hey, maybe digitial virtuosity IS, after all, a thing of classical music), but I find that it makes it a much better piece, pyrotechnic and kaleidoscopic, something like George Antheil or Leo Ornstein playing Confrey – which is far from inappropriate, given the influence of ragtime on these composers and their transsubstantiation of the form in their own piano music]. TT 75:35. Lots of fun, substance in a minute and a half of Cowell and 4 minutes of Nancarrow. Note that this CD came in various editions. The official release was Argo 444 457-2 as listed above, but I have what seems to be a promotional edition (“Mtd for BMG Direct Marketing, Inc.”) with no barcode, and I see on Discogs.com that there was also a club edition for Canada, G2 44457. Anything goes.